A lodging fixture at the base of Squaw Valley ski resort for decades, the Squaw Valley Inn will be redeveloped by The PlumpJack Group. The new project will replace the existing Squaw Valley Inn with a new 60-room inn and 34 exclusive slope-side residences – called PlumpJack Squaw Valley Inn & Residences. The new residences will be located at the base of the mountain and just steps from The Village at Squaw Valley, an area that includes shops, restaurants and additional lodging options. 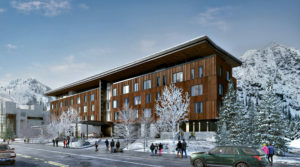 The PlumpJack Squaw Valley Inn & Residences will be available for advance purchase starting this winter. The residences will offer exclusive access and fringe benefits to buyers, including The PlumpJack Group’s portfolio of world-class wineries, luxury hotels, and innovative restaurants and bars, as well as the services available at the adjacent inn, including an on-site restaurant and bar, pool, spa, fitness center, and ski valet. Four Squaw Valley Alpine Meadows Gold season passes for the first ski season upon move-in. Complimentary three night stay at PlumpJack Squaw Valley Inn during the 2017/18 winter ski season. For more information about PlumpJack Squaw Valley Inn & Residences, visit www.LivePlumpJackSquaw.com.